If you are wondering what is the best brush for Yorkies, you are at the right place! you have to brush your Yorkshire terrier regularly with the right approach and with the right tools. but also how to use it properly. Because it doesn’t matter if you have the perfect tool, if you don’t know how to use it properly. How you should care for your dog’s hair? How to deal with mats and tangles? Before you can choose which brush is the best for your dog you should first understand what the structure of the coat of the Yorkie is. Ideally, the coat of the Yorkie is a single layer consisting of thick and silky fur which is shiny. Lots of breeders compare the Yorkie coat to the hair of the humans. Regular brushing is really important especially if your dog has a long hair. But even if the hair is short you have to brush your dog too. Just it is easier and it takes less time. But the wrong approach into keeping dog’s hair shiny and healthy is the worst thing that you can cause to its hair and skin. Apart from this, wrongly chosen tools could play an essential negative role for the dog. Sometimes, this negative effect, though, cannot be seen from the first few times you use the inappropriate hair tools. Thus, the cumulation brings an enormous and sudden harmful impact. Eventually, itching and skin irritation can even occur. At last, you will not only ruin your Yorkie’s hairstyle, but you’re going to ask yourself what the heck went wrong and how things can get better. Well, things will get better for your dog’s skin and hair once you leave aside the wrong combing approaches and tools and you apply the right ones. You need to, find the right brush and additional tools for your puppy. There are too many suggestions on the market when you start looking for almost everything. However, indeed, a particular brush can be fantastic, but other can be so bad that can cause serious damages on your Yorkie’s hair and skin. The ideal way for us to give you directions is to point you out the main qualities it should posses. Of course, the top element you need to be careful for is the pin type, size, distance from each other and etc. • First-class pins – as we said, they are the main “agents” of a great brush. If the pins are of a poor quality, soon they will break or start losing their shape, bending. This is how a brush becomes useless and inefficient. • The pin heads – gentle and sharp at the same time, because they are the main touch to the Yorkie’s skin. • Middle rate of tension – because if too high, irritation can occur and if too weak, no result will be achieved. 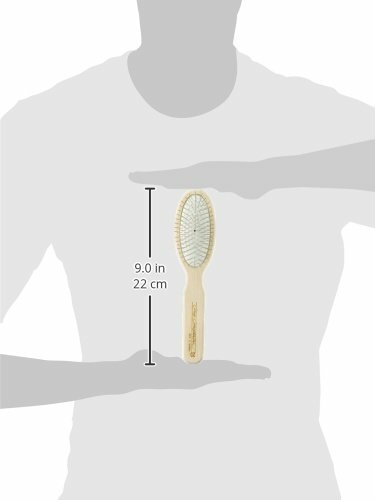 • The perfect brush size is the size you can comfortably hold in hand to have it relaxed and flexible during each movement, but also small enough to brush the hard reached places. • Consider boar bristle brushes, because they are indeed some of the best options on the market. They are very suitable for Yorkies with long hairstyles. We have decided to list you several products you might enjoy and like. Below we will make some reviews of the most appreciated tools for your Yorkie’s healthier, shinier and stronger hair. Which of them you Must have and which are optional for your Yorkshire terrier? This is a traditional tool for grooming which is made of fine wire bristles. Those bristles remove the dirt, the loose hair and the debris from the coat of the dog. It can also be used for removal of mats and tangles but may be too harsh for the skin of the dog and, therefore, should be carefully used. The slicker brushes work for long as well for short coats and are one of the must have items for all groomers and dog owners. That’s why a lot of Yorkie owners buy Slicker brushes for their dogs and most of the time this is because that’s what was recommended to them in the pet store. The thing is that the slicker brushes are perfect for double coated dog breeds (with outer coat and undercoat), and are not very suitable for Yorkshire terriers! Yes, they may be helpful for mats and tangles, but they are really not suitable for a daily using! That’s why we can say that the slicker brush is optional for Yorkies! 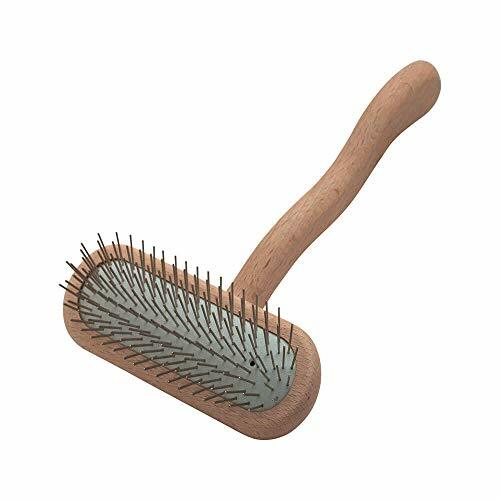 We recommend to consider this type of brush only if you are dealing with mats and tangles or if you usually keep your Yorkie with short hair. Extra small tool which works excellent for fine coats and rotates to provide massage while grooming. Its ergonomic handle will make the grooming sessions more comfortable and easier. 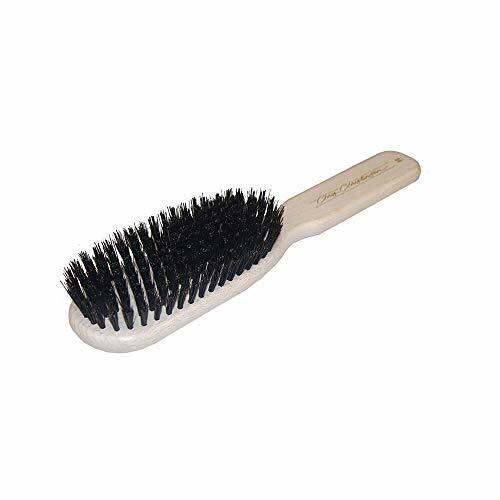 Actually this is not exactly a traditional slicker brush, because each pin has white rounded tips (like a pin brush), which makes it a safer option for the skin of your dog. The pin brushes differ from the slicker ones by having a protective ball at each pin’s end, thus, they prevent scratching of the skin of the dog. The gaps between the pin brush’s pins are wide and thus you’ll have lower risk of damaging the coat of the Yorkie. It’s not as effective in removing mats as the slicker brushes, but pin brushes are ideal for daily using. They are gentler on the Yorkie’s skin and may be easily used on long coats. It is not as likely the pin brushes to cause static charge while using them as it would be with slicker ones. The static electricity, if caused, will build up in the coat of the Yorkie, making it frizzy. Then the frizz may transform in mats and tangles, making the brushing ineffective. 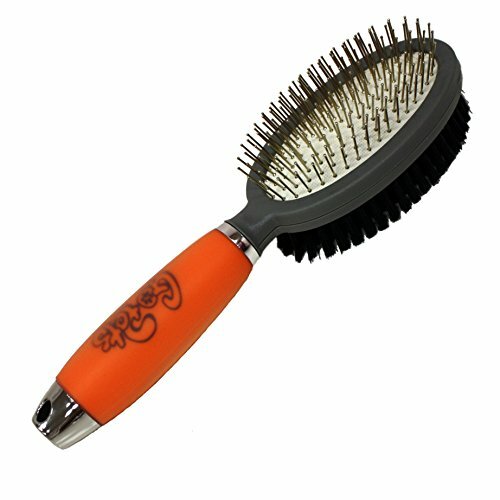 A pin brush is wonderful for small dog breeds and we can say that it is a must have tool for Yorkie owners! 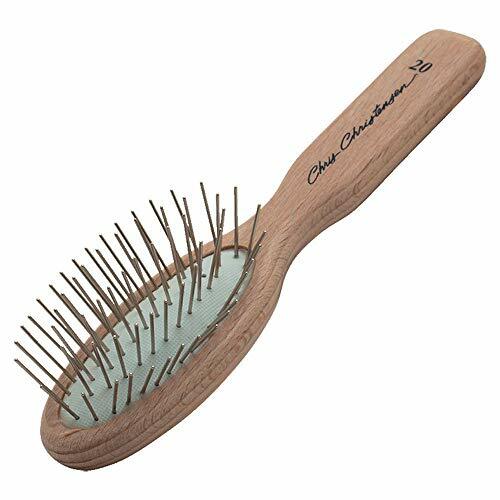 The Chris Christensen is a well-known brand, which is loved by its customers, and they have created a wonderful pin brush. With this tool you will find the brushing process easy and enjoyable. This product is famous because it is ultra-lightweight. This is the reason why it is a top product. This product has been steadily and quality crafted, which is why most of the customers are extremely satisfied with it. It is made of solid beach wood, which makes it durable and strong. The pins are made of stainless steel of high quality and their precise tips are responsible for the astonishing look of the coat after brushing. Made in Germany, the brush is produced according to all standards and is a high quality product. It is durable and sturdy, reliable tool which will serve you for a long time. It will not snag the fur and reaches deep into the coat and is very gentle to the skin and the coat of the dog. Excellent choice for the pet-parents who want their dog’s coat to be tangle-free and to look great. Unique for its design and its durability. This type of a brush glides through the coat with less wrist movement. Speaking of which, if you have a Yorkie, which is not used to be combed yet and you cannot teach it to stay still, while grooming, then having this at hand is great. You will hold it more easily and will use the support to relax the puppy. German number one dog’s brush. It has specially tailored tips right on the pins – fully polished and extremely soft for the skin. We love this product, because it is affordable and the investment is worth it, no doubt. Another type of brush is the bristle one, or the boar bristle brush which will be amazing addition to your grooming tools. It can be used on shorter and curly coats and removes the dead hair and the debris, leaving the coat shiny and smooth. This brush is an addition to the Pin Brush. It is optional but highly recommended! this GoPets combined tool is also good option if you are on a budget. This is double sided – pin brush on the one side and bristle brush on the other. It is good for short, medium and long haired Yorkies. The ends of the pins are rounded, which makes the it comfortable for the dog and it prevents irritation of the skin. Comfortable, non-slip handle filled with silicone gel. Remove dirt and loose hair. Gentle for your dog skin. Some people think that the bristle side is too soft. 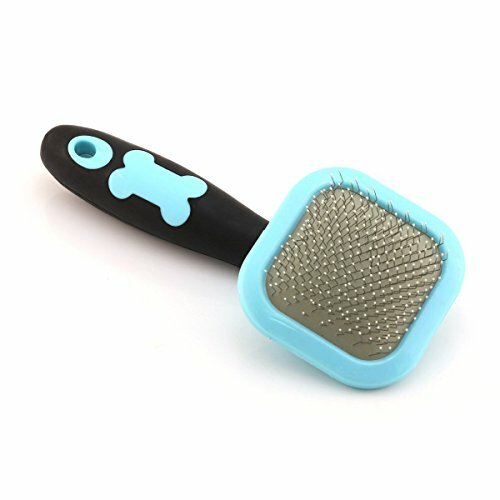 Because this is a good choice, if you prefer to buy 2 in 1 brush for your dog. How does the right, respectively the wrong tools can affect your Yorkshire terrier? Let’s start with the basics about the influence of a brush on a Yorkie. Below, we will prove you that brushing your puppy isn’t as pointless or insignificant as many people think. The difference between the wrong and right tools is the final effect they will produce. If you get to know all of these differences, you will realize how important it is to invest in a really good grooming products. So here is what you need to take under consideration about the influence of a brush on the Yorkie’s hair and skin. Of course, we want our dogs to have healthy and extra shiny hair. If you have the right brush, dullness will be overcome. The thing is that a Yorkie produces oil daily. This oil gets out of the skin’s pores. When you take the dog to the bath, though, the oil is thoroughly rinsed. Almost the same thing happens when you groom the puppy. However, if the brush is not qualitative enough, it will stick the oil inside the dog. In this way, the pores get clogged, the skin – irritated. On the contrary, the right one spreads the oil all around the hair, which makes it as shiny as you actually want. Smoothing Yorkie’s hair is something a puppy owners wants, but cannot achieve with a products of a poor quality. Frizzing comes due to lack of smoothness. And you know quite well that frizzy hair makes the entire coat damaged for a short time. Plus – many people get scared to brush the puppy looking how frizzing its hair becomes. And they realize that the more they brush it, the more frizzy it gets. So they stop. And knots cover the entire coat. So how can we avoid the frizzing and make the Yorkie’s hair smoother? It’s easy – you only need to invest in a high quality products. because this is a dog and you cannot make a dog enjoying its beautifying and spa days. It is an animal after all. But there’s no truth in this! As a matter of fact, high quality tools and products make the puppy feel a big pleasure during brushing. The flexible pins relax the skin and bring a sense of joy. On the contrary – the wrongly chosen tools annoys and sometimes, even hurts your dog. What is the solution? The secret formula: combing, brushing and spraying! combing, brushing and spraying. If you apply them, soon, your Yorkie will look and feel really well. It is a common mistake for Yorkie owners to believe brushing is completely enough for the coat. Combing is a very essential pre-treatment for the hair. Because there are things a brush cannot do and only the comb is able to. Experts say that the right combing with the right comb is the best preparation for an efficient brushing. Plus – let’s not forget that combing is able to treat the hair in details, leaving the hair separated into pieces, which can be brushed easier and more efficiently later. Last, but not least, the tiniest tangles you might not even see can be overcome only with combing. But what is the best comb for Yorkshire terrier? Well, for perfect results, you will have 3 combs and each will help you improves puppy’s coat in a different manner. • basic all-over body comb to go over the coat before brushing. • small facial comb to thoroughly go over the face and ears (or other small body areas). • de-matting comb for the least tangles inside the puppy’s coat. The professionals usually prefer a fine flea comb to work on the coat around the eyes, on the face and muzzle while choosing a sturdier comb for the tail and the body. 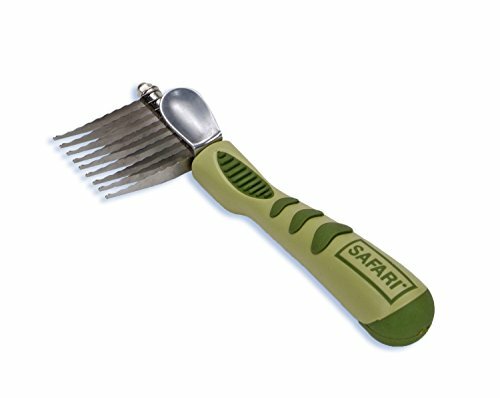 Safari Grooming Comb for Dogs, Stainless Steel. smooth rounded teeth that lets you accomplish complete grooming easily and quickly without making it suffer or get too annoyed to start torturing you with movements left and right. It is recommended by the experts (so do we!) due to its hair growth stimulating features. It is also tender to the skin and perfect against knots and tangles. The comb is great for small dogs, no doubt. The only downside is that some people say that it’s not very durable. The good thing is that it’s not expensive. A type of comb which is necessary for the fine and delicate fur of the feet and the face of the Yorkie. This comb is small and with tight teeth so it is wonderful for these sensitive areas. 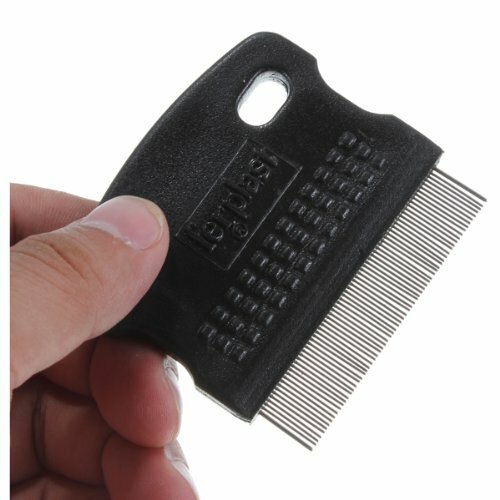 You should have such comb in your grooming kit if you want to provide the best grooming for your Yorkie. Here are some finishing combs which you may like. Lots of groomers recommend that you should have a small flea comb with fine teeth for the delicate parts of the Yorkie – like the muzzle, the eyes and the face – and it can also be used to remove tear stains. 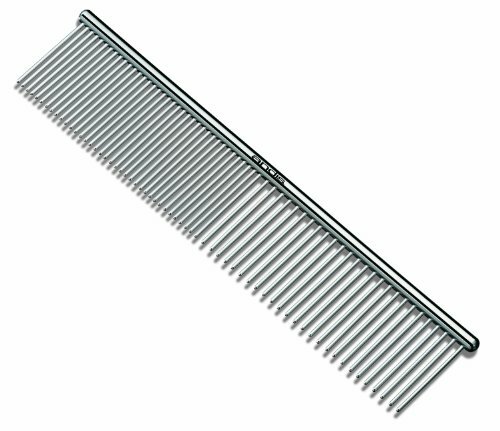 Small comb of stainless steel which has fine teeth and handle grip made of plastic for easy use. This is a flea comb which has two rows of teeth for thicker hair. It can also remove tear stains. Master Grooming Tools Face & Finishing Ergonomic Comb. This is a brilliant product for Yorkies. For its 40 tightly spaced 1/2″ stainless steel pins to rid hair of debris from tear stains, food, and dirt, this tool becomes the professional comb for any amateur. Besides, its convenient plaster holder is so comfy to be held. While using any of the mentioned above tools you should also use a proper conditioner spray for this leaves the hair of the Yorkie shiny, healthy and clean while also making the grooming easier. There are some amazing products which can suit any budget and all different needs. The spray is the other word for the typical puppy’s leave-in conditioning product. If you use such, not only good-looking, but your dog will also enjoy healthy skin. How to choose the right spray? Extra protective function is a good thing to consider, because let’s not forget that Yorkie’s contact to the ground, the floor, different items is always indirected with the hair. When hitting carpets or other items the dog loses the shininess and even the strength of its hair. Against the surrounding environment negative factors like wind, sun, snow and etc. All of these climate conditions can cause serious damage to your Yorkie’s coat. So, make sure you add a spray with a protective function against them. Long-term protection of breakage – because one of the worst things that can happen to anyone’s hair is split ends, hair breakages from the middle of the hair or even the roots. Traditionally, such a leave-in condition is applied right before brushing. If the coat has numerous tangles, applying a little bit of the spray is essential. There are sprays that can be applied for protection between the baths too. If you would like to learn more about Leave-in conditioners you can check out our article about shampoos and conditioners for Yorkies. Miracle Coat Leave-In Conditioner and Lusterizer for dogs. We just cannot start with other suggestion, but this one. It is capable to prolong the unparalleled luster and, meanwhile, it nourished both: the coat and skin. The product is 100% organic and it can be used on a regular basis with no risk. A spray conditioner, which will provide awesome results in a short time and will make the coat of your dog much more beautiful. The amazing shine of the coat can be achieved by small amount of the conditioner and this will also make the process of managing the fur easier. You can choose among several sizes in order to select the one that is best suitable for you. Moreover, the conditioner contains multiple vitamins and tea tree oil. This will protect the hair of your dog and will hydrate the skin. Most of the reviews from the clients are positive and the conditioner has average of 4.0 of 5.0. Usually the customers were mostly happy with the benefits of the spray and the better smell of the dog between baths. Below, we will provide you with the best tips and tricks to apply, when brushing your dog. These are only the essentials, but even if you rely only on them, it will be enough for healthy and good looking hair. The Yorkie’s hair cannot be brushed while wet; thus, this process should be done before you bathe the dog. After the bath, when the hair is damp the brushing process should be repeated. Still, you MUST NOT brush the coat of the Yorkie when it’s absolutely dry for that way the fine hairs will break off. There is one easy solution – spritz the coat with water or conditioner and brush the Yorkie when the coat is damp. In order for the Yorkie’s hair to be tangle-free, you must provide the dog with daily brushing and combing. However, for dogs with shorter hair these procedures might be done less often or only on areas of longer hair. From 10 to 15 minutes should be the duration of the brushing but if the hair of the pet has tangles or knots, you should first comb the hair and separate it in pieces, which can make the process longer. Make the brushing part of the daily schedule – for instance, while you are watching your favorite show. Once your pet is used to lying down, the whole process will be much easier. Do not forget to be calm and gentle. Professional and high-quality tools make everything easier. Owners who wish their dog’s hair to be long should choose also a boar bristle brush. The right dog brush is not always the most expensive one. Indeed, if you prefer the budget-friendly brush, but still of a middle and high quality, you need to replace it more often. Otherwise, its pins will no longer be efficient enough for the delicate brushing and the right tangle prevention. Dog Brushing is like art. You need to get used to be patient with your dog’s movements during the procedure and to stimulate it with the right approach to love the entire process. If your puppy is not happy in the beginning (for instance, when being too small and not used to these procedures), try again later. I mean after a few hours. Find the right moments your dog gets more peaceful and eventually, look for the signs of its enjoyment. Eventually, this enjoyment will come. Yorkies’ hair usually forms tangles because it is not brushed or is brushed incorrectly. The tangles, once formed, continue to grow. The tangles and the mats can form on every area of the coat, but they usually occur in areas of friction (for instance, the armpits) or in oily areas (such as the area behind the ears). Before giving the dog a bath you should remove all tangles and mats! Check the hair of the dog for mats especially in the areas of high friction as armpits, groin, behind the tail and the area where it wears a harness or a collar. At first use a wide toothed comb made of steel to check for tangles and mats. For really small tangles you can pull the hairs using just your fingers or you may use the help of a de-tangling spray. Comb the hair out of the mat, not the opposite. If there is a large mat, you should split it lengthwise. Sometimes there are no other options left but to cut the mat. Should you have to do this, be careful not to cut the skin of the pet. Important! Put a comb between the mat and the dog’s skin if you will be cutting the mat out using scissors. Sometimes it is hard to tell where the skin begins, especially with tighter mats. Then the comb will protect the skin, acting as a barrier. Tip: While brushing the dog, every time you see a mat or tangle you should stop and carefully work it out using your fingers and then resume the brushing process. Go through the coat one more time after removing all mats and tangles to give the coat of the Yorkie an amazing shine. If there are any hard to remove mats, you may need a de-matting comb to work them through or clippers to shave them out. You can do this at home or you can take the dog to a professional groomer. The mats will cause the appearance of bacteria, which will make the skin beneath the matted hair unhealthy, bruised and fragile. However, the Yorkie will feel much better if you cut the mats and its hair will certainly grow again. 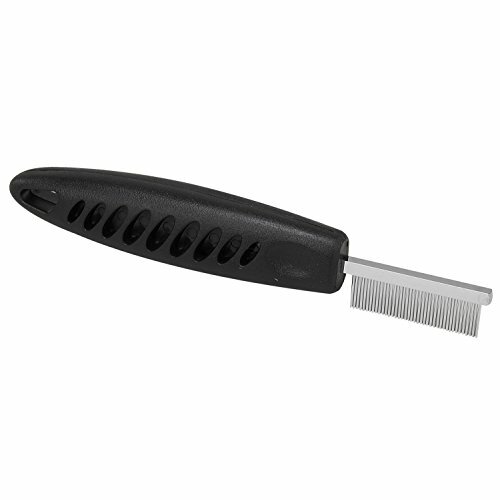 You will get plenty of features with the Safari De-matting comb. It works great when it comes to removing tangles and mats. Made of stainless steel, the tool can be used on every coat type and it does a wonderful job on coarse and long coats. With its reversible blades, the brush may be used with both the left and the right hand. With its guaranteed quality, many of the professionals recommend the tool. Do not forget to always use the comb in the direction of the growth of the hair. According to the customers, the brushing process will be much easier and faster. They say that the mats can now be rapidly untangled and the dog’s skin will not be hurt. However, some of the clients are not satisfied because the individual blades have serrated edges and this may cut the skin of the human or thin the coat too much. So, use the Safari de-matting comb carefully. Of course, the tool still does a great job dealing with the mats. It provides easy and fast mats removal, saves time of the customers and does not harm the dog’s skin. Recommend by real professional Yorkie groomers. Use it on the direction of the hair growth. The modern design of this tool will make you feel like a real grooming expert. In conclusion we can say that in order to avoid tangles, matting and to maintain your Yorkshire terrier hair healthy and good looking, you should invest in the right, high quality brushing products. If you keep the coat of the Yorkie clean and well-groomed you’ll prevent the formation of tangles and mats. Even owners who bring their pets to professional groomers should regularly brush and comb the coat of their Yorkies at home. Follow the tips in this article and feel free to share with as what kind of brush do you use by leaving a comment below.